© 2012 R.L. Delight. Plein Air studies. I am so fortunate at this time in my life to be living in a place of great beauty. It is a challenging place to live but worth it. I realized that I have to take advantage of my good fortune and paint where I live. The ocean has a huge presence here. 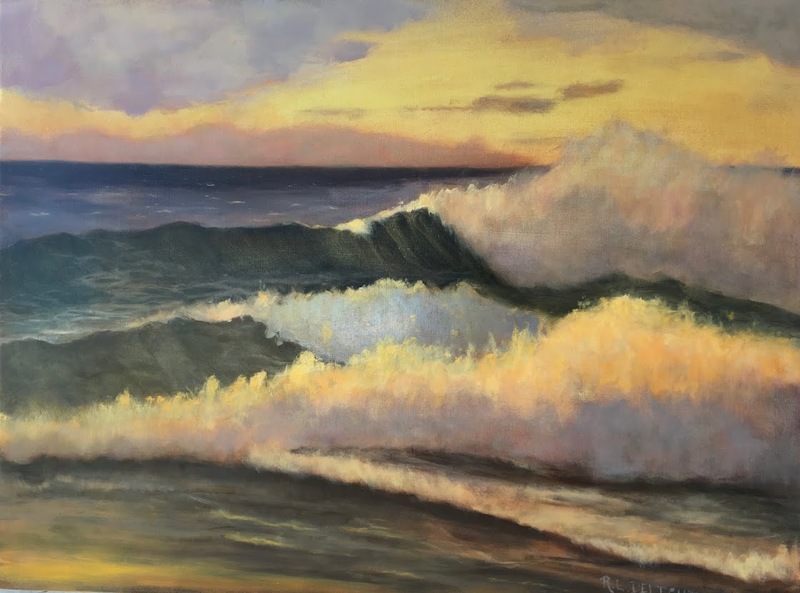 Even as I am writing this post, I hear the waves roaring on the beach, which is a short 5 minute walk to the water's edge from my house. Last night I was walking the dog before bed and an ocean mist was floating through the dark streets carrying the smell of the sea with it. The sound of the waves were particularly soothing. With this realization, I made a decision to start painting plein air on a regular basis. I am just starting out and learning as I go. At the moment I am painting on loose canvas that I have taped to a small drawing board. 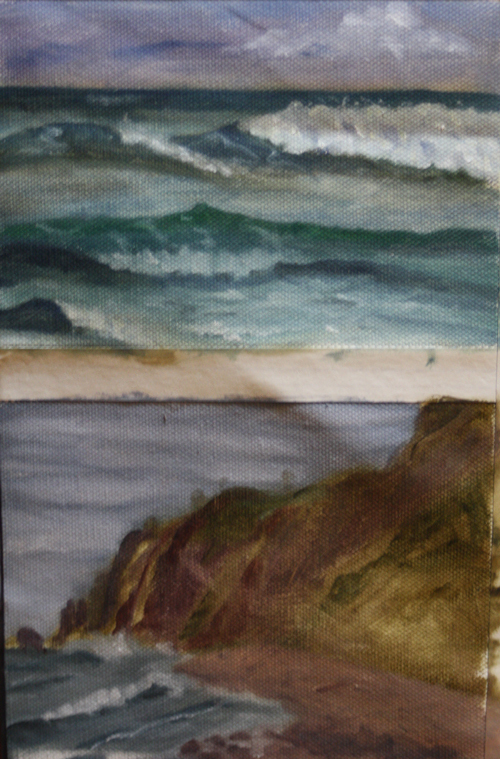 The top painting is a wave study. It would not make a good finished painting since I basically would focus on a certain aspect such as wave shape, tone, light, or color, paint it, and then move on to another aspect and then paint that. The painting is kind of a mish-mash of different waves and different focuses but all done from life. The bottom painting is one I did last Friday on a gray and wet day. It wasn't too cold, the winds were moderate, and only a few sprinkles so not too bad weather-wise. I ran out of time before I could finish the rocks at the base of the cliff. I would have liked more time in general but it is meant to be a sketch. This is at the foot of Neahkahnie Mountain which is one of my favorite places to go. At the right time, some of the waves bounce off the inner curve of the mountain and travel almost perpendicular to the oncoming waves. When the two kinds of waves meet they often crash spectacularly and make all kinds of interesting shapes. It is going to take a lot of practice to get to the level I would like to get to. I am starting now in the fall because I find the waves and sky are more interesting. I also figured that if I can do this over fall and winter in spite of the weather, I will be able to paint plein air year-round in almost any conditions (here locally that is, I melt in heat!). I will have to update my foul weather gear as soon as I am able to but, with a little invention and perhaps a bit of duct tape, I will be able to do it! I am starting with a once a week goal and will add another day for a twice a week goal once the first goal is set into a standard practice or habit. I don't have a set day as I like to check the weekly forecast and tide table. So, next week's plein air day? Tomorrow! The rest of my studio time is divided between painting small daily paintings, working on larger paintings, and studying my craft and honing my skills. Oh, one last thing. One of my small paintings was accepted into the Cannon Beach Art Gallery's miniatures show! The show opened last night and is part of the Stormy Weather Festival going on now in Cannon Beach. And yes, the weather is living up to the festival name! It is always a pleasure to be included in a show with so many lovely artists. Congratulations Renee! You are such an inspiration. I so admire your paintings and I admire your discipline too. Good luck with the winter plein air.